In patients diagnosed with diabetes mellitus (DM), the therapeutic focus is on preventing complications caused by hyperglycemia. In the United States, 57.9% of patients with diabetes have one or more diabetes-related complications and 14.3% have three or more. Strict control of glycemia within the established recommended values is the primary method for reducing the development and progression of many complications associated with microvascular effects of diabetes (eg, retinopathy, nephropathy, and neuropathy), while aggressive treatment of dyslipidemia and hypertension further decreases the cardiovascular complications associated macrovascular effects. [2-4] See the chapter on diabetes: Macro- and microvascular effects. Two primary techniques are available to assess a patient's glycemic control: Self-monitoring of blood glucose (SMBG) and interval measurement of hemoglobin A1c (HbA1c). The frequency of SMBG depends on the type of medical therapy, risk for hypoglycemia, and need for short-term adjustment of therapy. The current American Diabetes Association (ADA) guidelines recommend that patients with diabetes self-monitor their glucose at least three times per day. Those who use basal-bolus regimens should self-monitor before each meal and at bedtime (four times daily). Initially some patients require more frequent monitoring, including both preprandial and postprandial readings. Patients with gestational diabetes who are taking insulin should monitor their blood glucose three or more times daily. Patients should be educated on how to use real-time blood glucose values to adjust their food intake and medical therapy. Recently several companies developed continuous glucose monitors (CGM) that measure interstitial glucose levels and have been shown to improve glycemic control without increasing the risk of hypoglycemia. Patients still need to check their blood glucose levels two times a day to calibrate the CGM device. Table 1: Recommendations for target glucose levels. Abbreviations: AACE=American Association of Clinical Endocrinologists; ADA=American Diabetes Associations. HbA1c measures nonreversible glycosylation of the hemoglobin molecule (expressed as a percentage of total hemoglobin), which is directly related to blood glucose concentrations. It reflects mean blood glucose values over a 2- to 3-month period and can be used as a predictor of a patient's risk of microvascular complications. Periodic testing is recommended in all patients with diabetes. The frequency depends on the clinical situation and the patient's treatment regimen. The ADA recommends that patients with stable glycemic control be tested at least twice a year. Quarterly testing is suggested for patients who have had a recent change in therapy or who are not meeting their glycemic goals. Testing of HbA1c does have some limitations. HbA1c levels are influenced by rapid red blood cell turnover and blood loss; therefore, anemia and hemoglobinopathies can result in inaccurate values. Physicians should consider these conditions when there is a substantial discrepancy between HbA1c and SMBG values. Also, episodes of hypoglycemia and hyperglycemia cannot be determined using HbA1c values alone. The ADA 2014 Position Statement on diabetes management  lists the correlation between HbA1c and mean blood glucose values (Table 2). Table 2: Correlation Between HbA1c and Average Blood Glucose Values. IFCC = International Federation of Clinical Chemistry and Laboratory Medicine. Traditionally, it has been recommended that therapy be adjusted to maintain HbA1c values near or below 7% in nonpregnant adults. For patients with type 1 DM or type 2 DM who become pregnant, the goal is less than 6.0%. The AACE recommends an HbA1c of less than 6.5% in nonpregnant adults. The ADA recommends that select patients, especially those with long life expectancy and few comorbidities, adopt glycemic targets close to normal, providing the target can be achieved without causing significant hypoglycemia. When considering appropriate pharmacologic therapy, a major factor to consider is whether the patient is insulin deficient, insulin resistant, or both. Treatment options can be divided into noninsulin therapies—insulin sensitizers, secretagogues, alpha glucosidase inhibitors, incretins, pramlintide, bromocriptine, and sodium glucose cotransporter 2 (SGLT-2) inhibitors—and insulins (insulin and insulin analogs). Table 3 lists the noninsulin therapies available. Table 4 lists the insulin therapies. Abbreviations: DPP-4=dipeptidyl peptidase-4; ER=extended release; GI=gastrointestinal; GLP-1=glucagon-like peptide- 1; SGLT-2=sodium-glucose cotransporter-2; SC=subcutaneous injection; UTIs=urinary tract infections. Insulin sensitizers reduce glycemic load primarily by improving insulin actions in peripheral tissues. Two classes of these oral hypoglycemic drugs are available: biguanides and thiazolidinediones. They have been shown through more than a decade of clinical use to have positive, durable effects in the treatment of diabetes. These drug classes can be used as monotherapy or in combination with sulfonylurea, insulin, or with each other. Metformin was first marketed in the 1950s. Its primary mechanism of action is suppression of hepatic glucose output, but it also enhances insulin sensitivity of muscle and fat. Metformin primarily lowers fasting glycemia; however, some decreases in postprandial glucose concentrations, especially after the midday meal, are seen. Metformin is well tolerated, with the most common side effect being gastrointestinal (GI) complaints, such as diarrhea, nausea, and abdominal discomfort, and a metallic taste. All of these symptoms improve with time and dose reduction. Metformin causes a small increase in basal and postprandial lactate concentrations in the blood, which can produce rare but life-threatening lactic acidosis (<1 in 100,000). [14,15] It is best to avoid metformin use in patients with hepatic impairment. Metformin is contraindicated in males with a serum creatinine 1.5 mg/dL or higher and in females with a level 1.4 mg/dL or higher. A major benefit of metformin is that it usually does not lead to hypoglycemia when used as monotherapy. It can lead to weight loss, and it has been shown to decrease plasma triglycerides concentration by 10% to 20%. Thiazolidinediones (TZDs) are agonists of peroxisome proliferator-activated receptor gamma. They primarily enhance sensitivity of muscle and fat, and, mildly, the liver, to exogenous and endogenous insulin. These effects lower fasting and postprandial blood glucose levels. Major side effects include weight gain, with an increase in subcutaneous adiposity and fluid retention, which typically manifests as peripheral edema although heart failure has occurred on occasion. These effects are mostly seen at higher doses. As a result, these agents should be avoided in patients with functional class III or IV heart failure. The PROactive trial (PROspective pioglitAzone Clinical Trial In macroVascular Events) showed that compared with placebo, pioglitazone does not increase cardiovascular risks. The TZDs have been associated with an increased risk of bone fractures, particularly in women. They do not cause hypoglycemia when used as monotherapy. Pioglitazone use leads to lowering triglycerides, increasing high-density lipoprotein (HDL), and increasing the low-density lipoprotein (LDL) particle size. Insulin secretagogues stimulate secretion of insulin from the pancreas, thereby enhancing glucose uptake by muscles and fat and decreasing hepatic glucose production. Two types of secretagogues are marketed: sulfonylureas and glinides. Glinides work in a manner similar to sulfonylureas; however, they have a more rapid onset of action and shorter duration, so they are a good option for patients with erratic timing of meals. Also, the hypoglycemia risk is lower than with sulfonylureas, but they have a similar-to-lower risk of weight gain after initiating therapy. Caution must be used in patients with liver dysfunction. Dosing is before meals. Incretin-based therapies are available as injections (GLP-1 analogs) or oral formulations (DPP-4 inhibitors). These therapies differ slightly in their mechanisms of actions, as described in the following sections. All incretin-based medications carry an increased risk of acute pancreatitis. Patients must be warned about this risk and be advised to stop taking these medications and to seek medical evaluation if acute abdominal pain develops. These medications should not be given to individuals who have a history of medullary thyroid carcinomas or have multiple endocrine neoplasia type 2. This restriction is based on increased incidences of thyroid C-cell tumors observed with these medications in murine models. So far, no increased risk in humans has been observed. Nevertheless, the above groups of individuals should not use these medications. Exenatide is a synthetic form of exendin 4, a hormone found in the saliva of the Gila monster, which mimics glucagon-like peptide-1 (GLP-1). GLP-1 is produced in the small intestine. It stimulates insulin secretion and inhibits glucagon secretion and hepatic glucose production in a glucose-dependent manner. It also delays gastric emptying and suppresses appetite through central pathways. It primarily decreases postprandial blood glucose levels; however, a moderate reduction in fasting blood glucose levels also can be seen. Due to its delaying effects on gastric emptying, the major side effects are GI complaints of nausea, vomiting, and diarrhea. Hypoglycemia does not occur when exenatide is used as monotherapy or with metformin, but it does occur when exenatide is combined with a sulfonylurea. Benefits include weight loss up to 2 to 3 kg in the first 6 months and up to 5.5 kg in the first 2 years. Liraglutide is a GLP-1 analog derived from human GLP-1. It is administered once a day as a subcutaneous injection from its pen device. Timing is independent of meals. Half-life is about 13 hours. Its beneficial effects and side effects are similar to those of exenatide, but it may be slightly more powerful in its actions. The initial dose is 0.6 mg/day for a week. If there are no side effects, the dose is increased to 1.2 mg/day (the dose at which most clinical benefits are seen). For most patients, dose will be increased to 1.8 mg/day after another week if there are no side effects. Exenatide also is available as a once per week injection, supplied as a kit containing 2 mg of extended-release exenatide. If a dose is missed, it should be administered as soon as noticed provided that next dose is scheduled 3 or more days later. Albiglutide is a newer GLP-1 analog that has a half-life of 4 to 7 days. It is given as 30 or 50 mg weekly injections. Dulaglutide is another long-acting GLP-1 analog. It is given as 0.75 and 1.5 mg weekly injections. Dipeptidyl peptidase-4 (DPP-4) is a cell membrane protein that rapidly degrades GLP-1 and glucose-dependent insulinotropic polypeptide. Suppression of DPP-4 leads to higher levels of insulin secretion and suppression of glucagon secretion in a glucose-dependent manner. The DPP-4 inhibitors act primarily on postprandial blood glucose levels, but reductions in fasting glycemia are also seen. These agents are generally well tolerated, with the most common side effect being headache. An increase in nasopharyngitis also has been seen. Benefits include that it is weight neutral and does not cause hypoglycemia as monotherapy or when combined with metformin or thiazolidinediones. When combined with sulfonylurea or insulin, it increases the risk of hypoglycemia. Four DPP-4 inhibitors are approved by the US Food and Drug Administration (FDA) for use in type 2 DM: sitagliptin, saxagliptin, linagliptin, and alogliptin. These agents are indicated for use as monotherapy or in combination with other agents such as metformin, sulfonylureas, thiazolidinediones, or insulin. Sitagliptin dosing is 100 mg orally once daily with or without meals. Dose reduction is needed in patients with renal impairment. For patients with a creatinine clearance of 30 to 50 mL/min, dosing is 50 mg once daily. For patients with a creatinine clearance less than 30 mL/min, dosing is 25 mg once daily. Saxagliptin dosing is 2.5 or 5 mg orally once daily with or without meals. The 2.5 mg daily dose is used in patients whose estimated glomerular filtration rate (eGFR) is <50 mg/mL and those using the strong inhibitors of P450 3A4/5 (eg, ketoconazole, ritonavir). Linagliptin dosing is 5 mg orally once daily with or without meals. Dose reduction is not needed in renal impairment. Alogliptin dosing is 25 mg orally once daily with or without meals. Dose reduction is needed in renal impairment. In patients with a creatinine clearance 30 to 60 mL/min, dosing is 12.5 mg once daily. In patients with a creatinine clearance below 30 mL/min, dosing is 6.25 mg once daily. Pramlintide is a synthetic form of amylin, a hormone secreted by beta cells that acts to suppress glucagon secretion, slow gastric emptying, and suppress appetite through central pathways. It acts primarily on postprandial blood glucose levels. Efficacy data from well-conducted studies are lacking. Dosage varies in different patients. The major side effects are GI complaints, especially nausea and hypoglycemia. Benefits of therapy include weight loss of 1 to 1.5 kg over 6 months and up to 4.5 kg after chronic therapy. Pramlintide is FDA approved only as adjunctive therapy with insulin, but it is used off-label in patients with either type 1 DM or type 2 DM. Pramlintide can reduce insulin requirements by up to 50%. The starting dose for patients with type 2 DM is generally 60 µg subcutaneously before meals. In patients with type 1 DM, the starting dose is 15 µg before each meal. Pramlintide can be used by patients taking insulin, metformin, or sulfonylureas. Fast release bromocriptine improves glycemic control in patients with type 2 DM when taken within the 2 hours of waking up. Mechanism of action is not known. Improvement in Hba1c is 0.6-0.7%. It is sold as 0.8 mg tablet and therapeutic dose varies from 1.6-4.8 mg. Nausea is main side effect. The SGLT-2 inhibitors are the newest group of FDA-approved medications for type 2 DM. SGLT-2 is a protein acting as sodium-glucose cotransporter in the kidney's proximal tubules whose main function is reabsorption of the filtered glucose from the urine back into the circulation. It is responsible for about 90% of total glucose reabsorption. Inhibition of this protein leads to the excretion of glucose in the urine at much lower blood glucose levels than normal (at approximately 120 mg/dL instead of 180 mg/dL). The most common side effects of SGLT-2 inhibitors are vaginal yeast infections and urinary tract infections. The greatest risk is seen in female patients and in uncircumcised males. Polyuria also may occur. Additional benefits are weight loss (two-thirds of weight loss is related to loss of fat tissue and one-third is related to loss of water) and lower blood pressure. These medications are not indicated in children, in patients with type 1 DM, frequent ketones in their blood or urine, or severe renal impairment. Patients should be advised to expect glucose to be in the urine and, thus, urine glucose strips will usually have a positive reading. Three SGLT-2 inhibitors are currently available: canagliflozin, dapagliflozin, and empagliflozin. Canagliflozin is dosed at 100 mg/day before the first meal of the day and can be increased to 300 mg/day, if tolerated. Canagliflozin should not be used in patients with eGFR less than 45 mL/min/1.73m2 and should be limited to 100 mg in those with eGFR 45 to 60 mL/min/1.73m2. Dapagliflozin is dosed at 5 mg/day and can be increased to 10 mg/day, if tolerated. It should not be used if eGFR is less than 60 mL/min/1.73m2. Empagliflozin is dosed at 10 or 25 mg once a day. It should not be started if eGFR is less than 60 mL/min/1.73m2. If eGFR decreases below 60 mL/min/1.73m2 while patient takes this medication, it should be continued at 10 mg/day and stopped if eGFR decreases below 45 mL/min/1.73m2. At this time, empagliflozin is the only antidiabetic medication shown to decrease cardiovascular risk in patients with type 2 DM. Insulin was the first treatment for diabetes. It was discovered in 1921, and clinical testing in humans started in 1922. 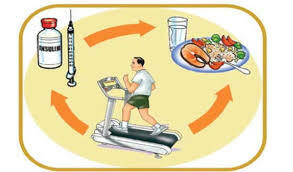 Insulin therapy remains the most effective method of reducing hyperglycemia. There is no upper limit in dosing for therapeutic effect, so it can be used to bring any elevated HbA1c level down to near normal. Other benefits of insulin include its effects on reducing triglycerides levels and increasing HDL. Most brands of insulin are available in both vial and pen form for delivery. Table 4 lists the insulin formulations. Several different regimens are used to administer insulin therapy (Table 5). All patients with type 1 DM require insulin therapy, which is available as basal-bolus therapy or insulin pump. Patients with type 2 DM often require insulin, which can be combined with oral hypoglycemic agents. Regimens used are basal insulin only, twice-daily premixed insulin, basal-bolus, and insulin pump therapy. Abbreviations: HbA1c=hemoglobin A1c; MDI=multiple daily injections; NPH=Neutral protamine Hagedorn. The basal-bolus regimen combines a long-acting agent (administered once or twice daily) that provides basal insulin needs and a rapid-acting agent for prandial coverage. Traditionally, when initiating therapy with glargine or detemir as the basal insulin, 50% of the total daily dose is given as basal insulin and the rest as prandial insulin divided equally before meals. The prandial insulin dose can be fixed, but it is better to determine the dose based on the carbohydrate content of the meal. This requires learning carbohydrate counting and knowing the insulin dose required to cover the carbohydrates. A diabetic educator can help patients adjust their insulin dose based on carbohydrate consumptions. The starting daily insulin dose is typically 0.3 U/kg total daily (divided between long-acting and rapid-acting) (Table 6). A key to achieving glycemic control is appropriate SMBG by the patient and frequent adjustment of the regimen. Patients who are able to monitor blood glucose several times during the day and to make insulin dose adjustments. The ADA and the AACE have published different algorithms for initiation and maintenance of therapy in patients with type 2 DM. [13,23] No studies have compared the efficacy of these algorithms. Table 7 lists the initial dose and titration of insulin therapy for type 2 DM. The starting daily insulin dose is typically 0.5 U/kg total, divided between long-acting and rapid-acting. Therapy can be combined with oral insulin sensitizers but not secretagogues. In patients with gestational diabetes, insulin therapy is indicated when exercise and nutritional therapy are ineffective in controlling prandial and fasting blood glucose levels. Basal therapy alone may be sufficient, but basal-bolus regimens are often required. Glycemic control is crucial for preventing microvascular and macrovascular complications of diabetes. Type 2 diabetes is a progressive disease and requires therapy intensification with time. Type 1 diabetes requires insulin therapy.